What breakfast food does this photo represent? EMAIL your answers and leave a comment designed to either help or confuse your fellow game players. The first contestant to EMAIL me the right answer wins a featured link in my blog which will display until next Monday when we’ll play this little game again. Enjoy. December 6th, 2010, 8:35 a.m. — Gary — I think it’s half something, like Half-Baked …. I have sent a guess. Don’t know if it’s close or miles off the mark, but it’s all my brain had to offer. Thanks for the challenge and to Amoeba for this week’s pun. Loved your bird photos below, by the way. Jealous of your seedy visitors and your gift as a photographer. Close, Raven — but not close enough! Help! Need a Comments Moderator! I always check first thing when I get to the blog, Karen. We slept in this cold morning. How did my comment (which you were supposed to delete) end up down here? It’s supposed to be above my “winning” comment! Karen — I didn’t change the time stamp. I don’t know what to tell you — and why would I delete it? It isn’t offensive. I have no idea. I usually skip breakfast. Karen — if you have no idea, how is it that you won? This really is your lucky day. Mar — better than being a serial person …..
After all my guesses for last week’s contest, I think I’m all thought out. Also, I have a feeling that whatever this breakfast food is, it’s not available in Australia. I certainly don’t see any Vegemite in that oven. Mumma — your comment made Amoeba laugh out loud! Barely had my eyes open when something popped into the brain. If it’s not right, it’s at least funny! Kelley — it is right — and it is funny. Glad you appreciated this! Well, HAT’s a real stumper of a Punny Monday! I have no idea but sent a guess anyway. 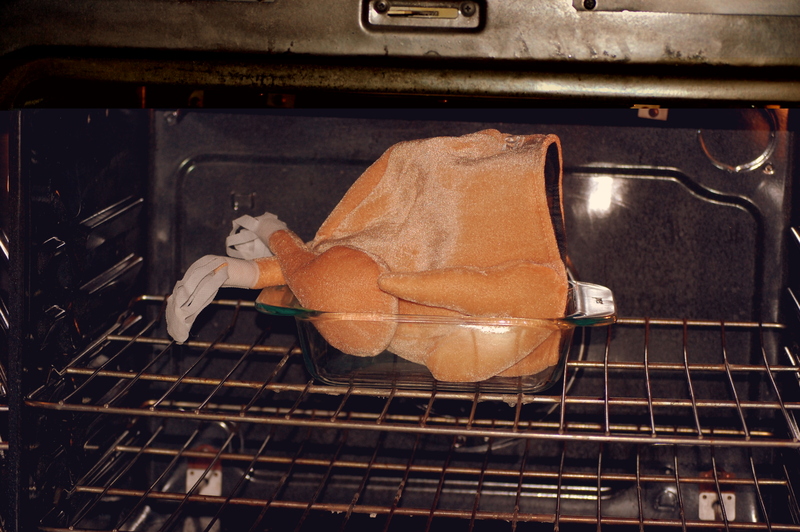 Susan — I loved your comment in your guess … I woke up early for this you know — I’ve been up since 5:30 and still have no clue about what a turkey-hat-in-the-oven might be! I laughed out loud. Karen — you’re a mom after my own heart. I can’t even figure out what’s in the photo let alone any food. Thom — trust me, there is no food in that photo. It is the infamous turkey hat. You were supposed to use your imagination — oh. never mind. I forgot who I was typing to …. Oh yeah now I see it. I should have known. It is yiour new schedule, I’m sure. What are you doing up so early! Linda — LOL! Too literal today? Guess I’ll take a random shot again. I’d pretty much given up but at least I thought of something for this one even if it’s the wrong one. Did you send me a guess? I didn’t receive it. Thanks to the comments I now know that’s a hat…huh…still blank. Off to do mindless chores…maybe something will flutter into my birdbrain. Shelley — if it does, it will be too late! No wonder I didn’t get it…turkey bacon…never goes into my shopping cart ..it’s either turkey – or bacon. Shelly — we don’t eat turkey bacon, either. Horrid stuff for everything but puns. That’s great. The fact that it was half of a turkey and what appeared to be cinnamon sugar sprinkled on it threw me off..
Linda — cinnamon sugar? I recommend an optometrist. Now that’s pretty clever. Congrats to those with their turkey hats…er, thinking caps on. Barbara — when Amoeba suggested this I cracked up laughing and I have been pretty much laughing ever since! Thanks Thom!! I’m a double-winner this week!! Moondust Writer — stop thinking. The game is over! LOL I have no idea as I am having a hard time guessing the photo. Stacie — this one was a poser! LOL – that is a clever shot and good guessing by your fellow bloggers on the title. Oh, I get it now! Clever. Caryl — it was all Amoeba. His mind works in amazing ways.